Pierre Auguste Renoir; sold 26 June 1900 to (Durand-Ruel, New York and Paris). Probably Alexandre Berthier [1883-1918], Prince de Wagram, Paris. (Durand-Ruel, New York and Paris); by whom sold 23 October 1926 to Chester Dale [1882-1962], New York; (sold, Parke-Bernet Galleries, New York, 16 March 1944, no. 65); (Dalzell Hatfield Galleries, Los Angeles). (Gabriel Schneider Gallery, New York). Vladimir Horowitz [1904-1989], New York; gift 1948 to NGA. Prince of Wagram per Chester Dale Papers, Archives of American Art (copy, NGA curatorial files). After his death, Wagram's collection was sold by his heirs through Étienne Bignou, Paris, to Alex Reid & Lefèvre, London; it is possible Durand-Ruel repurchased this painting at that time. Annotated sales catalogue, Knoedler Library microfiche American sales no. 1369. Schneider according to François Daulte, Auguste Renoir, catalogue raisonné de l'oeuvre peint, Lausanne, 1971-, vol. 1, no. 597. Exhibitions of Paintings by Renoir, Durand-Ruel Galleries, New York, 1924, no. 1. 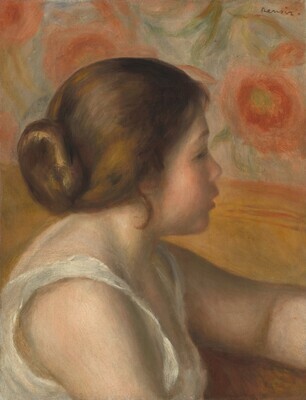 Renoir au XXe siècle, Galeries nationales du Grand Palais, Paris; Los Angeles County Museum of Art; Philadelphia Museum of Art, 2009-2010, no. 37, repro. Dale, Maud. Before Manet to Modigliani from the Chester Dale Collection. New York, 1929: no. 30, repro., as Head of Girl. François Daulte. Auguste Renoir, catalogue raisonné de l'oeuvre peint. Vol.I: Figures 1860-1890. Lausanne, 1971: no. 597.